Rich curries and modern-day street foods common to northern India have gained steam in South Park, where cuisine from the subcontinent was non-existent until now. 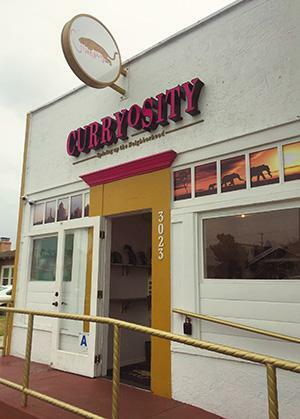 The whimsically named Curryosity opened last October with a menu that steps a little beyond classic dishes such as tikki masala, clay-oven chicken (tandoori) and spiced pureed spinach (saag). 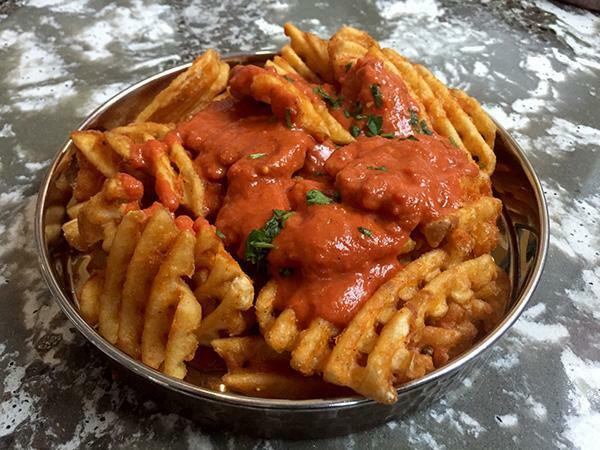 Mingled within are rarities like curry waffle fries and an exhilarating appetizer known as dahi puri, which is listed here as “yogurt explosion.” Chances are you haven’t encountered either in other Indian joints. Chef-owner Raj Mutti is a native of northern India. After emigrating to Los Angeles, he began cooking and serving at his sister and brother-in-law’s West Hollywood restaurant, Flavors of India. There, he rubbed elbows with Dolly Parton, Leonardo DiCaprio and other luminaries who came knocking for spicy, exotic fare. 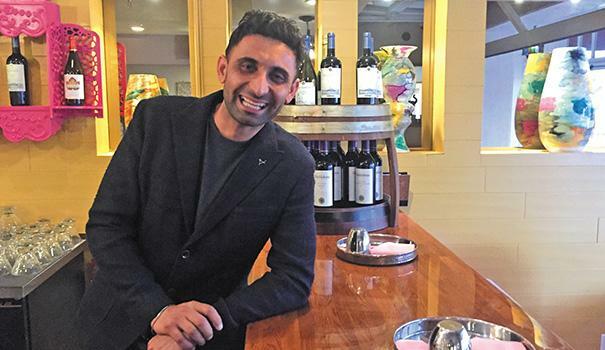 Intent on owning his own restaurant, he moved to San Diego and opened Spice Lounge in Pacific Beach. 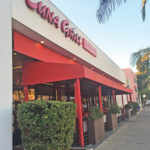 Seven years later, Curryosity serves as an evolved offshoot geared to a more sophisticated demographic. Amid a tasteful blend of refined décor, bold murals, and a second seating area in the back featuring low tables and couches, Mutti wanted to “back away” from the red-and-beige color scheme inherent to scores of other Indian restaurants. So with a white and golden-yellow color scheme, the atmosphere still manages to pay homage to his homeland while blending with the charm of South Park. 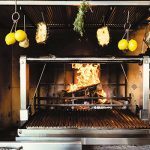 My vegetarian friend felt right at home, as 50 percent of the menu is meat-free. Visiting during the recently introduced lunch service (11:30 a.m. to 3 p.m., Friday through Sunday), we started with the delectably crispy waffle fries. The sauce draping them was thick and silky — nothing like the thin, brownish curry sauce served with fries in British pubs. This had a bright orange hue and tasted tangier. The “yogurt explosion” lives up to its nickname. 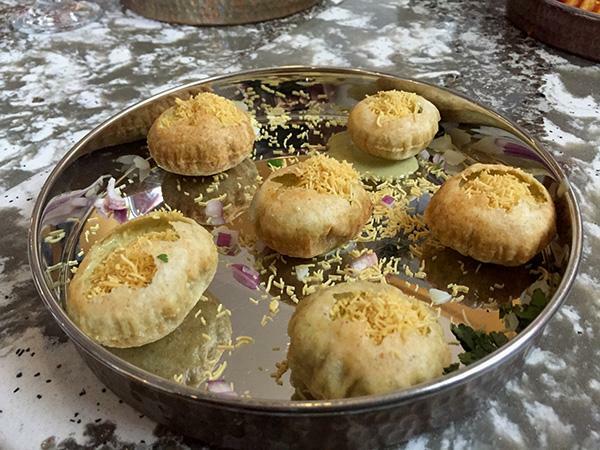 What you get are six semolina balls that have been hollowed out and filled with chaat masala spice blend, fresh mint, plain yogurt and minced potatoes. They’re sprinkled on top with “chickpea noodles,” which we initially thought was finely grated cheddar cheese. Too delicate and runny to cut into bites, you pop each ball separately into your mouth and behold a mini explosion that is cool and spicy and too unique to pass up. A cup of chicken soup stocked generously with cubed breast meat also proved incredibly flavorful, thanks to a bouquet of ginger, onions, garlic and cilantro in the recipe. My friend’s karma soup was creamy from coconut milk and bulky from lentils. It offered nuances of yellow Thai curry. Mutti said the fusion aspect is deliberate in some of the dishes, such as the “nirvana” curry bowl I ordered as my main lunch entree. Similar to panaang curry found in every Thai kitchen, coconut milk came into play again, and the curry sported a reddish color and slight kick from chili paste. The large pieces of chicken breast were fork-tender. 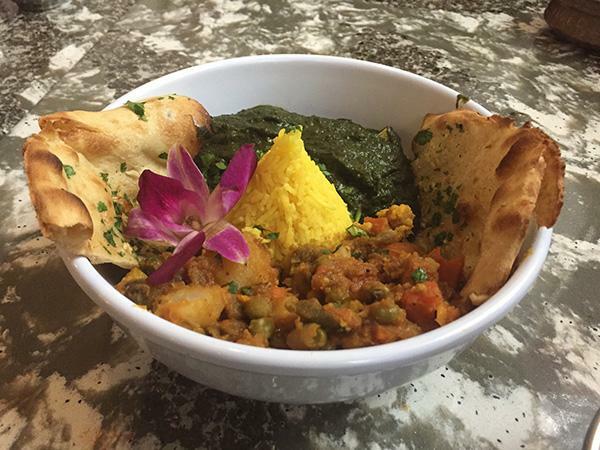 They saddled up to long-grain turmeric rice, garlic naan bread, and spiced vegetables cooked to a very soft texture. My friend’s bowl of saag included the same sidekicks. The stewed spinach was thickened by paneer cheese and expertly flavored with proper measures of ginger, garlic and toasted cumin. I normally don’t like the grassy flavor of cooked spinach, but this swooned my taste buds. 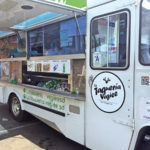 Other choices on the lunch menu include cheese or vegetable samosas, tandoori shrimp, chicken tikki masala, and a cream-kissed curry named “happy cow,” which features paneer cheese in a base of tomato and onion puree. 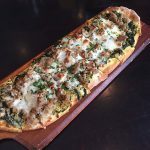 The daily dinner menu is a bit more expansive with inclusions such as naan bruschetta, chicken or paneer pakora, vegetable korma, and Indian-spiced rack of lamb. 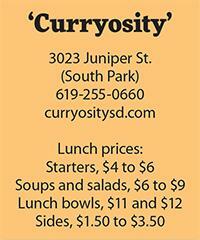 Curryosity’s weekend lunch service is followed by happy hour, from 3 to 5 p.m. Friday through Sunday. 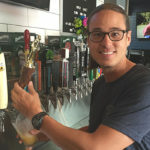 The deals include appetizers, beer, wine and soju cocktails for $4 each, along with chicken wings made with a variety of curry sauces for $7 per order.